Another successful Luau! I arrived on Saturday afternoon, after walking through the burn. Late last year, most of the approach was burned up in the Pole Creek fire, and now it is desolate and very dead and try. Kind of sad, but that is nature. Five of us climbed North Sister on Sunday: Myself, Nathan, Mark, Noel, and Mikela. We departed from base camp at 7:30am, ascended the ridge directly, and tracked it up toward the summit. As the ridge tops out, the route traverses around toward the south side of the mountain, where you meet a pass. The route in this area always seemed easier going up, though my instinct was that the pass was lower. We kept going up, almost descended to where I thought the pass was, but ended up at exactly the right spot. Good thing the team didn't want to descend! At the Terrible Traverse, we set a fixed line. I had not set this before, but it worked out well. First I tried to find a route upward against the face, but after a few moves the rock was just too unstable. So I headed in the standard way across the traverse. There was a nice boulder for an anchor near the start, and just as solid an anchor at the other end, and somebody had left some intermediate anchors (which were made of pieces of their rope that they apparently cut), which we also used for secondary protection. There seemed to be only one way across the traverse, and it was difficult to find, but once we found it, it wasn't very tough to get across. From the traverse, we belayed up the Bowling Alley, and then free-climbed from there up to the saddle, and up the final summit block, reaching the summit at about 2:15pm. It was a beautiful day, and we spent about a half hour enjoying the view. The sketchiest part of the descent was just below the saddle, before the first anchor; several of the team said that was too scary. Perhaps next time we can set a line there; it shouldn't be too difficult to anchor, and there might even be enough rope from the Bowling Alley belay, which is not that long. We rapelled down the Bowling Alley, back across the fixed line at the Terrible Traverse, tore down and headed out. This time, I marked the pass on my GPS so that I could find it next time. I still felt like we would normally be lower, but Mark and I headed down a gully and found it unpleasant, so the rest of the team stayed high until they were on the east side of the ridge. We descended the south ridge toward Prouty Peak, then down the scree field, and walked out on nice trails. 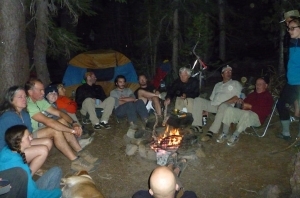 We got back to base camp around 8pm, for an excellent nachos meal and a lovely campfire evening. Posted some pics! Please contribute your pics if you would be so kind - it's the easiest thing ever, just upload them all at once and you're done. See HERE for instructions. Everybody will love you! Can someone tell me who ended up with Adrian's club rope? Or if it made it back to him? Greg, Nathan has the rope. I will connect with him and get it. Thanks, and thanks for a great trip.